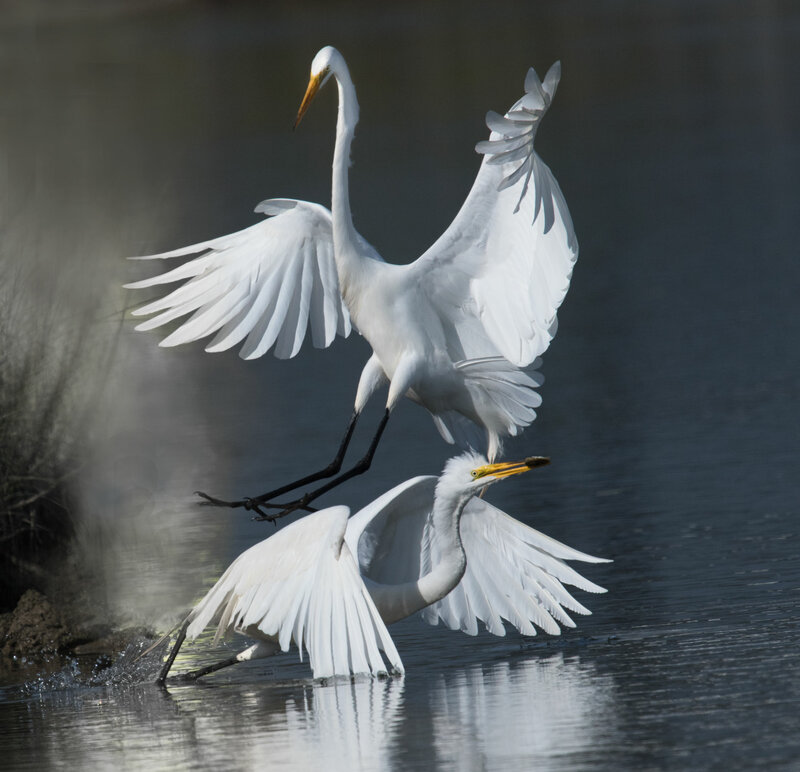 2019 Tangier Island Photo Workshop features photography of a unique waterman community and local wildlife. 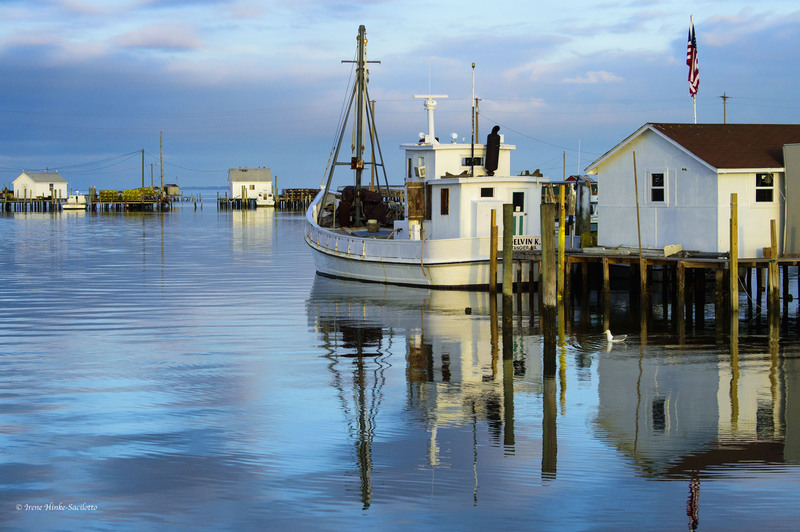 Just south of the Maryland line, in the middle of the Chesapeake Bay, lays Tangier Island, VA. 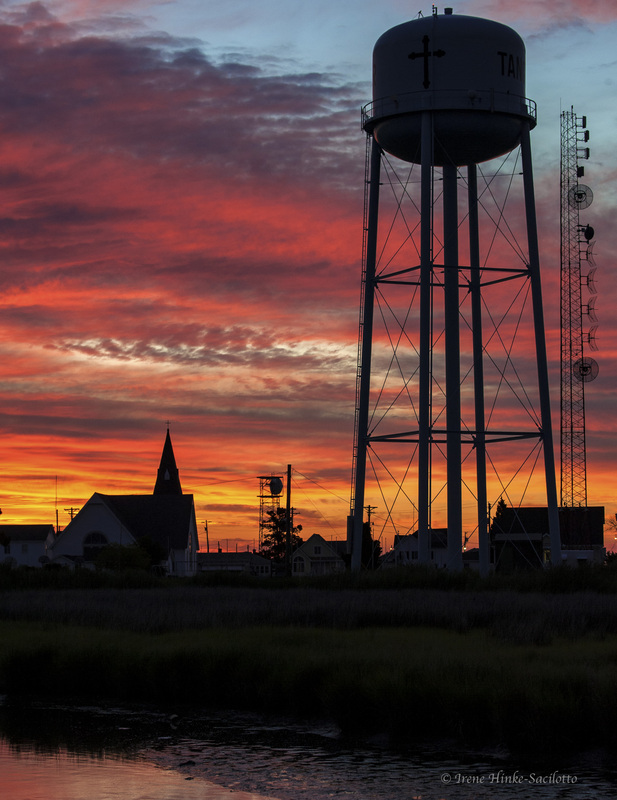 Covering approximately 1.2 square miles, Tangier Island is actually a series of small islands connected by narrow wooden bridges spanning marshes and tidal creeks. Tangier is a charming community of waterman and shop owners. Many inhabitants make their living, as did their ancestors for more than 400 years, by crabbing, fishing, and oystering. Each day we will rise before dawn, hoping to capture sunrise images and photos of the waterman as they man their skiffs and works boats, heading out to their offshore crab shanties to gather up their crab pots, scrapes, floats, and other gear for the day. For photos from the water, Saturday morning I chartered a boat for a trip around the island with the hopes of photographing the docks, waterman at work, and local birdlife. 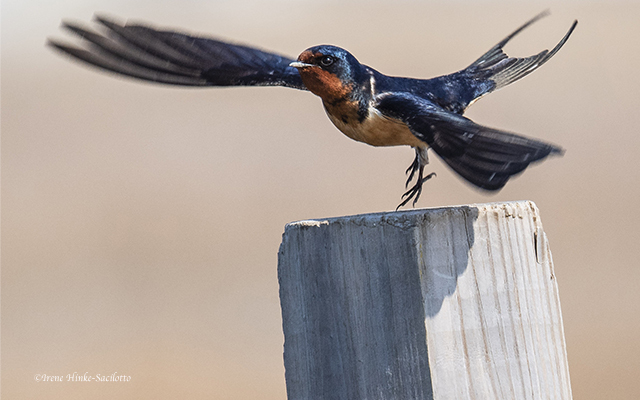 Barn Swallow leaving post heading for nest under bridge. From the mainland, Tangier can only be reached by boat or small plane. Golf carts replace cars as the primary mode of transportation on the island since the streets are narrow and barely wide enough for 2 carts to pass. It’s a peaceful community with friendly people and no traffic lights or violent crime. There are no banks, arcades, and only 2 bed and breakfast accommodations. Many born on the island speak a unique dialect of English dating back to that used by the first settlers arriving on the island from Cornwall England. 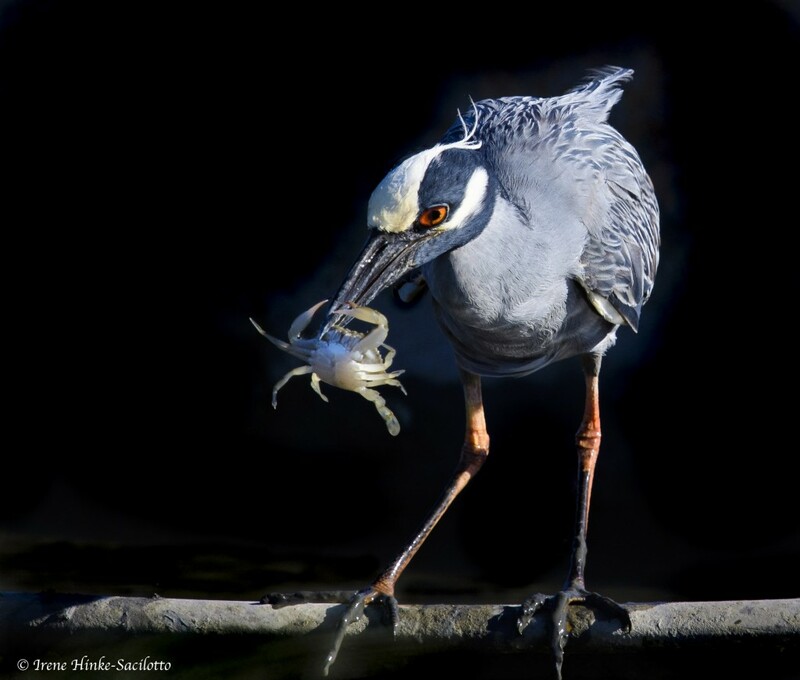 This photo workshop offers you a rare opportunity to photograph the unique way of life on the Chesapeake Bay, one that is slowly disappearing. Potential subjects include workboats, offshore crab shanties, working waterman, historic buildings, the waterfront, birds, and unique features of the island. 5 p.m. departure by boat from Crisfield, MD (Sharon Kay @ the main dock). 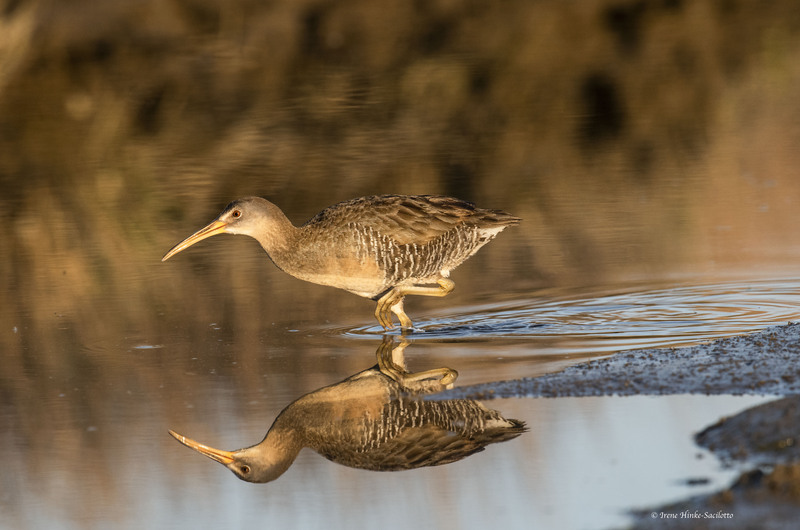 I will meet your boat in at the dock & arrange for transport of luggage to B & B.
Friday p.m. – Explore beach, lagoon, and tidal guts looking for photo subjects–wildlife, patterns in the sand, shells, and beach vegetation. Ending the day with sunset photography. Dawn photography at the main dock. 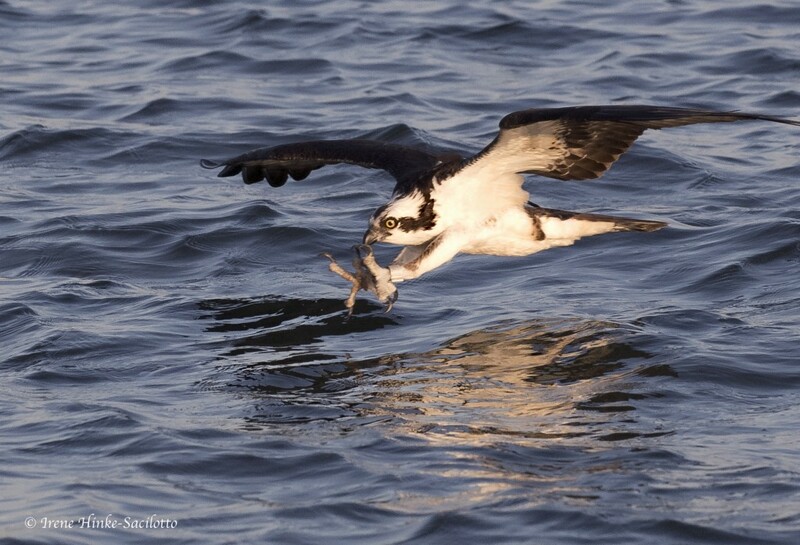 Board chartered boat (Sharon Kay) for opportunities to photograph crab shacks, working watermen, ospreys, etc. with early morning light, approximately 7:00 a.m. until 8:30/9:00 a.m.
Breakfast @ B&B, 9:30 a.m. – 10:30 a.m.
Prep of images for review, 10:30 a.m. – 12:30 p.m. Critique of images, 12:30 p.m. – 2:30 p.m. 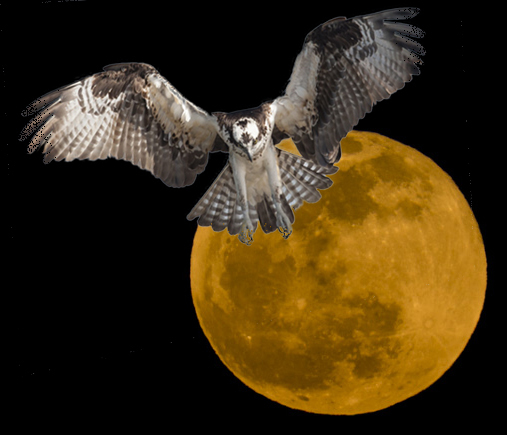 Remainder of evening free to prepare images for review on Sunday. Photography – life along the tidal guts, people, boats, etc., 7:00 a.m. – 9:30 a.m.
Prep of images for review, 10:30 a.m.-12:30 p.m. Critique session @ B&B: 12:30 p.m. – 2:30 p.m.
2:30 p.m.– 3:00 p.m. return golf carts, and transport luggage to dock. Board boat for return to Crisfield before 3:00/3:30 p.m. Exact schedule & locations are dependent on the weather, safety considerations, subject availably, & group interests. PRICE: $865 based on double occupancy, additional $ 85 single supplement. DEPOSIT: 50 % of total. Final payment due 30 days prior to workshop. The price includes: instruction (one on one interaction in the field); image critiques; two nights accommodations at a B&B with a private bath & full breakfast; a 1.5 hour boat charter trip to photograph crab shanties, waterman and ospreys from the water; and golf cart transportation on the island. Departure for Tangier from Crisfield on Friday is at 5:00 p.m. with return to Crisfield on Sunday at 3:00 p.m. (approximately 1 hour crossing). Alternately, participants can travel to Tangier using the ferry from Onancock, VA.
Photo workshop size is limited to 3 to 8 participants. Bring laptop and flash drive for transfer of images for critique. Bring camera equipment – wide angle to telephoto, tripod, flashlight, polarizing filter, rain gear for you and your equipment, etc. Visa/Master Cards are not widely accepted so bring cash for snacks, boat transport, etc. Bring sunscreen and insect repellant. Bring 3 images (1 where the light is extraordinary, 1 beach scene, and 1 animal) on a flash drive for discussion during the workshop when time permits. Note: I will scout locations on Tangier several days prior to your arrival to become familiar with current conditions. 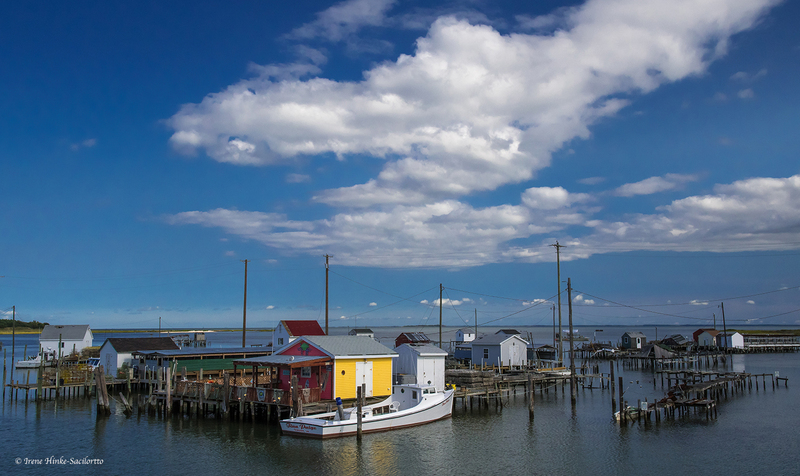 Crab shacks of Tangier Island.